Lipoproteins carry cholesterol; there are various sizes of lipoproteins, HDL, VLDL, LDL, IDL, ULDL... VLDL is very small compact (dense), large LDL is fluffy and buoyant, both having different metabolic and pathologic properties. People of greater risk have small particle LDL (which surprisingly has less cholesterol in particles), greater potential to bind arterial wall, oxidise easier. Cholesterol is vital for every aspect of human biology, all cells capable of creating cholesterol; LDL originates in liver of lipids and proteins complexed together creating cholesterol, being triglyceride rich. There are different forms, VLDL, and LDL origin from different precursors in the liver. Lipase breaks down lipid via donating triglycerides to cells into smaller and smaller dense particles as part of metabolic processes LDL is a bi-product of metabolic conversion. These smaller particles seem to be the greater risk factor for atherosclorotic plaque formation. Humans don?t have efficient ways of removing LDL from blood. HDL is a particle associated with lower heart disease risk, as opposed to LDL. HDL scavenges cholesterol from blood. Inflammation increases VLDL, inflammation increases the release of endotoxins which is a lipo polysaccharide from bacterial cell wall in the gut and binds to lipoproteins, which is an adaptive response to prevent infection. 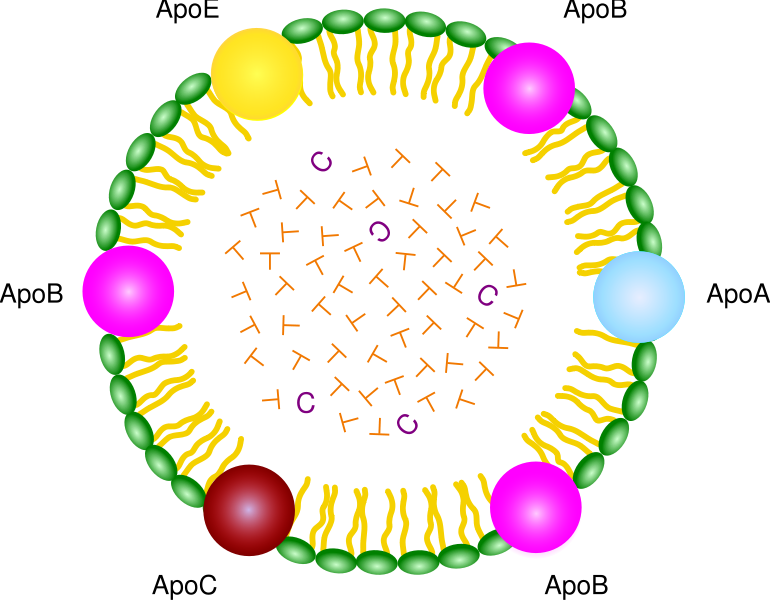 Endotoxins bind lipoprotein VLDL. Inflammation is a measure factor in converting cholesterol into a dangerous form. Lipoproteins play a vital part in defence mechanisms, the liver makes apo-B which gives integrity to lipoprotein particles, they are synthesised in the liver and degrade constantly, VLDL is a huge molecule which contains components that help promote inflammation in circulatory systems. VLDL are pro-inflammatory proteins which fight infection stimulated by cytokines released in response to plaque or bacterial rapid response. LPS is produced through infectious inflammatory process. The role of LDL receptors in liver is crucial to regulating LDL in blood, which in turn lowers LPS levels. The binding of LPS to lipid proteins stimulate more LDL receptors, they are cell surface receptors that mediate endocytosis of cholesterol in inflammatory response rich LDL by recognising apo-B which is imbedded in the outer phospholipid layer of LDL particles, the receptor is found in almost all cells. LDL receptors are most abundant in the liver, where about 70% recycling occurs. 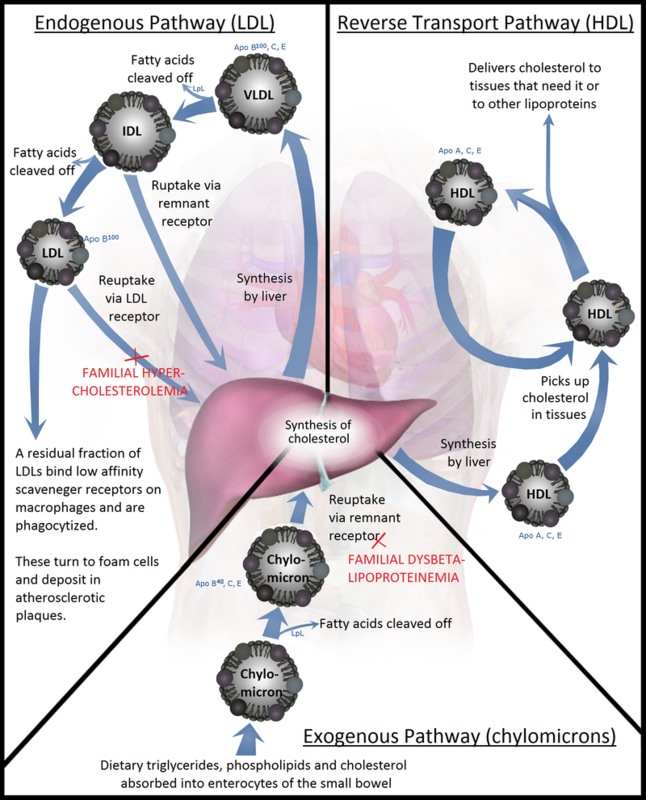 LPS binds LDL, LDL receptors in liver decrease LDL and LPS levels. HDL does to some extent.
. The smaller the particle the less affinity for the LDL receptor, less capable of being removed by liver.
. Smaller particles have greater binding affinity to arterial wall.
. Saturated fat increases large LDL NOT small LDL, there is no evidence saturated fats increase plaques.
. Processed meats confound heart disease risk.
. Large LDL on low fat diets increases small LDL.
. High carbohydrates increase small particle LDL.
. Simple sugars (fructose) have a high potential to increase small particle LDL, and increase obesity. That is refined fructose, not in the context of fruit, as the dose is low as opposed to coke, which is concentrated with a high absorption potential. Fruit with its fibre content buffer response, and slow breakdown. Fructose in the liver = fat. Statins increase LDL receptor activity, and receptor mediated uptake. Small particle LDL is not cleared as much by statins, unquestionably statins lower risk by as much as 30-40%, but not without some notable side effects, such as muscle damage/breakdown, changes in metabolism, changes in function, reduced strength. Increased risk of type 2 diabetes 11-12%, in women this is can be as much as 30-40%.. Needs further editing, so a bit of a work in progress..